Welcome to the 6th stop on the Tailgate Tour, Washington. 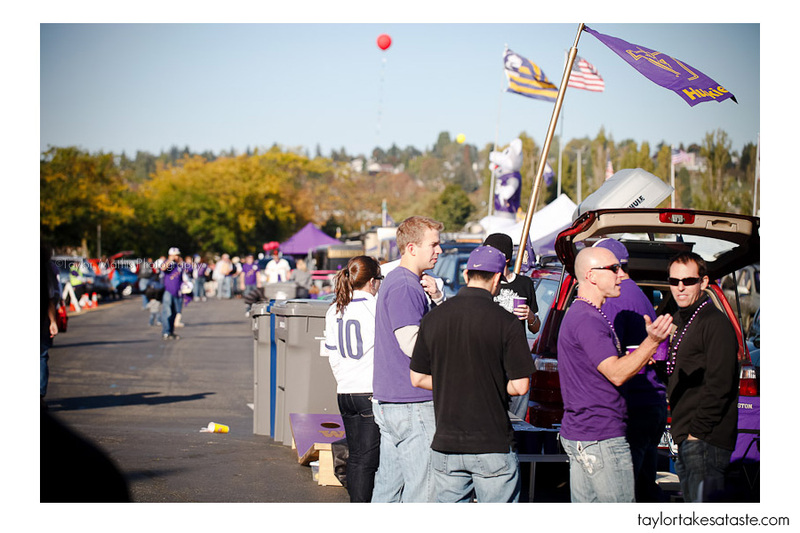 The Washington Huskies are the only west coast school that I am going to visit, but from what I heard prior to my visit they can tailgate as well as any school out there. They don’t stop at tailgating on land, o no. 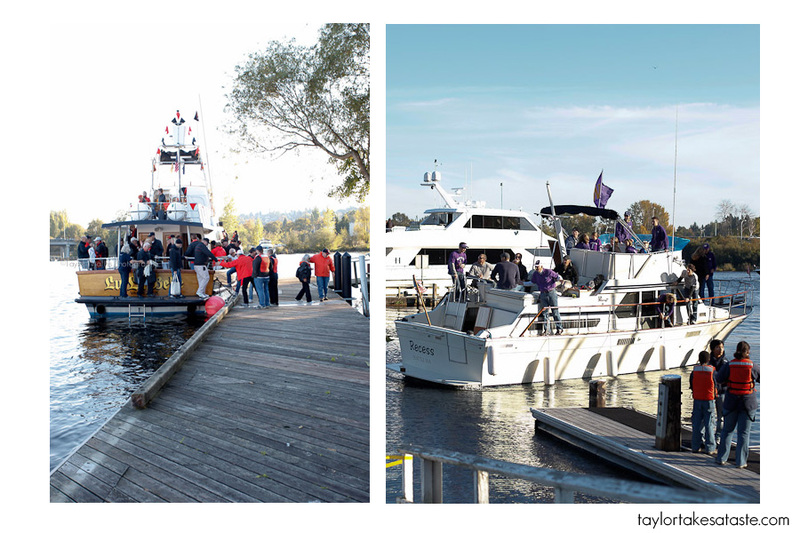 With a Stadium next to Union Bay the Huskies bring their pregame festivities onto the water. Who needs to sit in traffic going to the game when you can arrive by water. I heard great things about this seemingly unlikely West Coast spot, but I must say I was impressed with what I found. I attended the October 16th game against fellow PAC-10 opponent Oregon State. In case you see any beaver references, Oregon State’s mascot is a beaver. 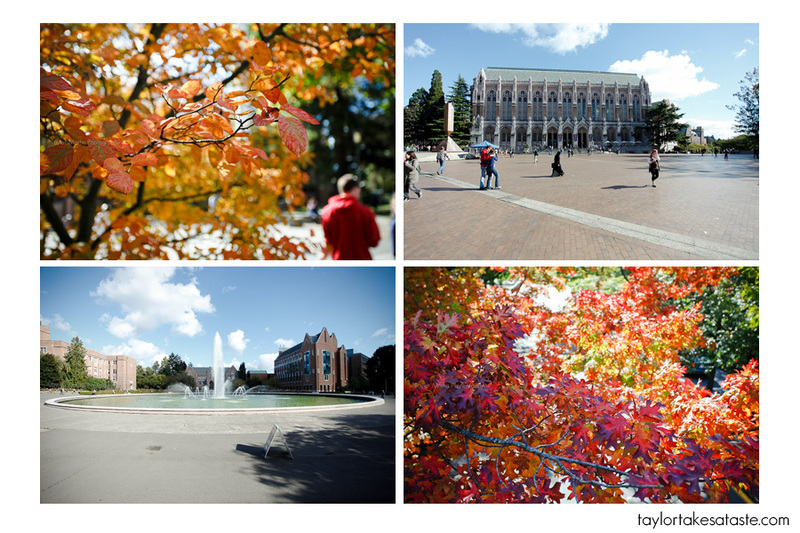 I had visited Seattle a few times, but had never been over to Washington’s Campus. It is a beautiful place, especially this time of year with the fall colors of the trees coming through. You may notice that the weather on game day was bright and sunny. I know the stigma about Seattle is that it is always raining and cloudy, well this is true a large part of the time. It rained on Friday when I was there so I did get to experience it. What you do not hear about is when that sun does come out it is tough to find a more beautiful and scenic place to tailgate at! 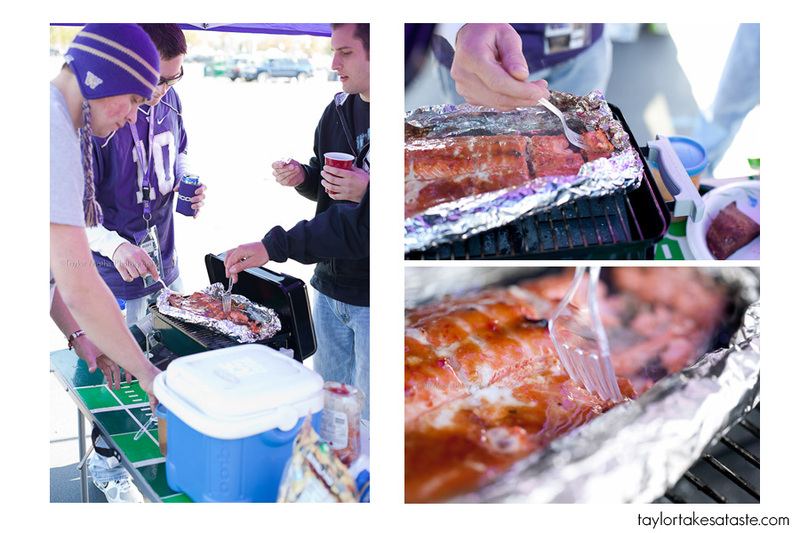 55 degrees and sunny, I could not have had better weather to tailgate in! ( Photographically I would have preferred the clouds with no rain, but o well that is out of my control). Here is what the main parking lot looked on Friday. Similar to VA Tech, if you are still in this lot on game day and don’t have a pass. You will be towed. Here is this same lot on game day. The left side is the before picture taken at 10:33am. The right side is an after picture taken at 6:44pm. This was a night game with a 7:15 kickoff. Here is what I discovered in my 8 hours of tailgating. 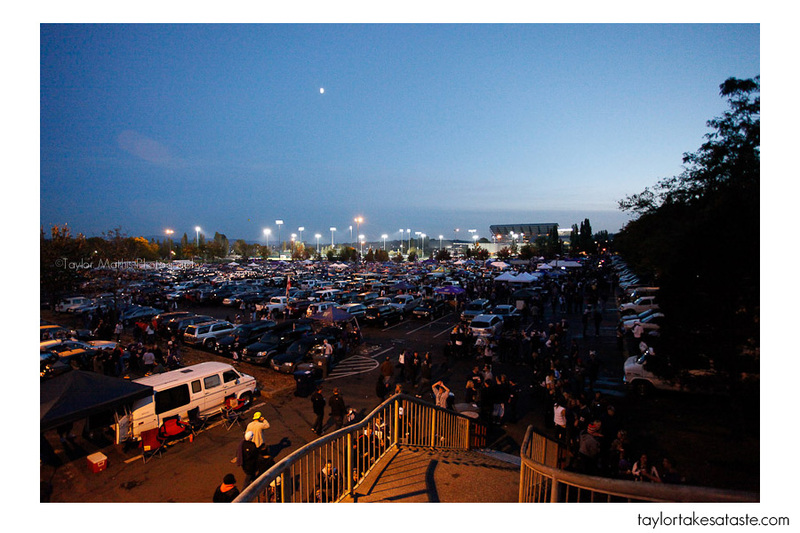 I spent most of the day in the North lot, which is the main tailgating lot. There is a smaller South lot and a few smaller lots all over campus, but this lot is where the majority of people do their tailgating. 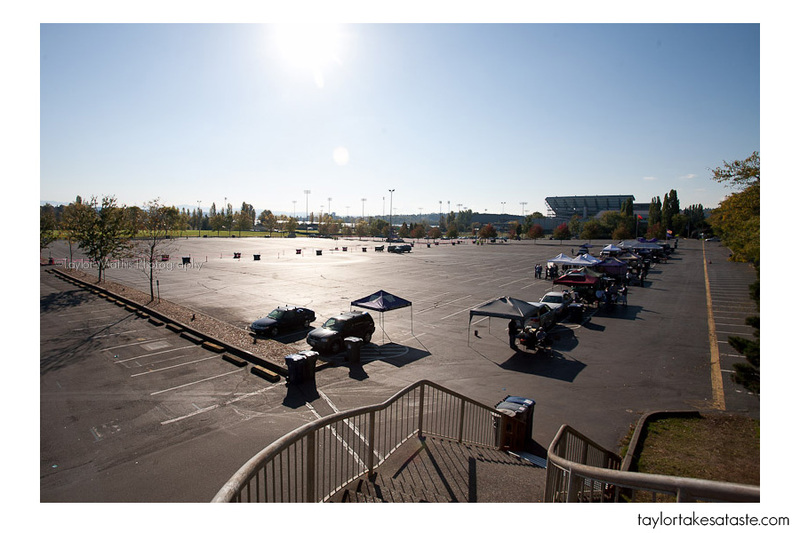 This season there is construction that has taken over the south lot and has changed the tailgating atmosphere. It used to be that the general public would get to park in the North lot along with the pass holders. This would cause the lots to fill up very quickly, but now the North lot is only for pass holders and took almost until game time to fill up. 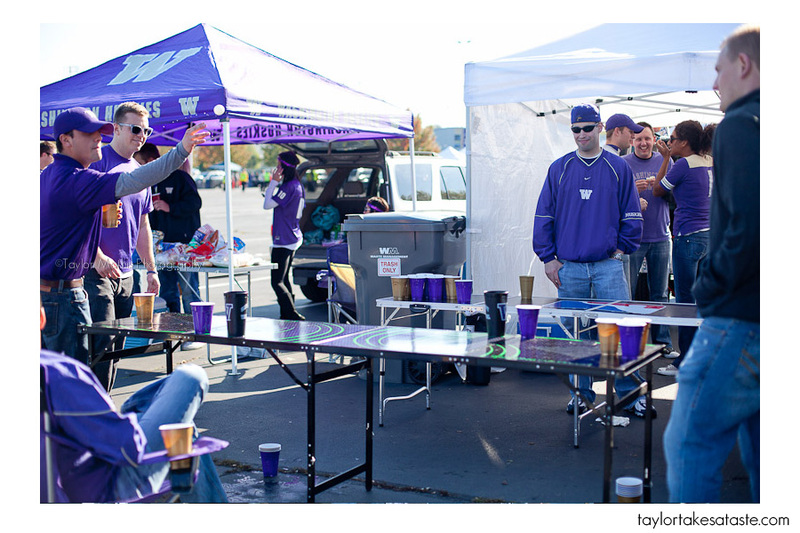 Current tailgaters expressed their unhappiness, but there is nothing they can do, so they just adapt. So how does one begin an 8 hour tailgating experience? With a good breakfast! When you only have one burner and one pan you have to get creative. Eggs, sausage and bagels all at once. 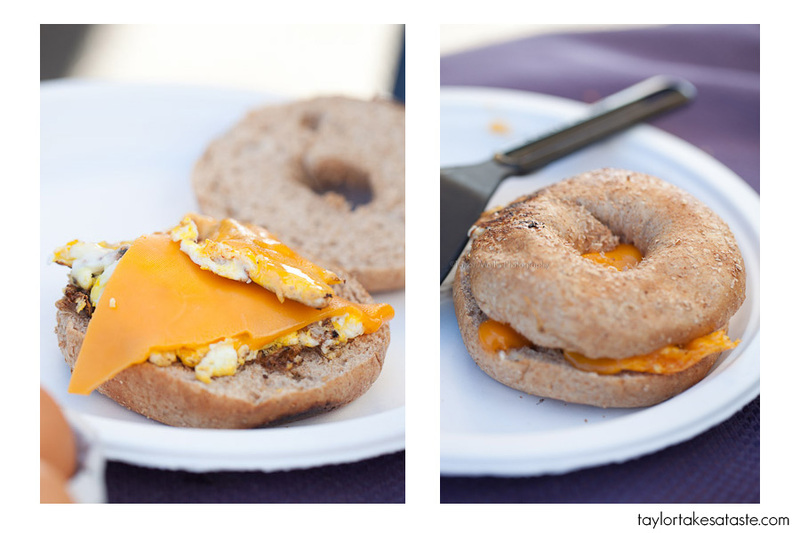 Add some cheese and you have an awesome breakfast sandwich! 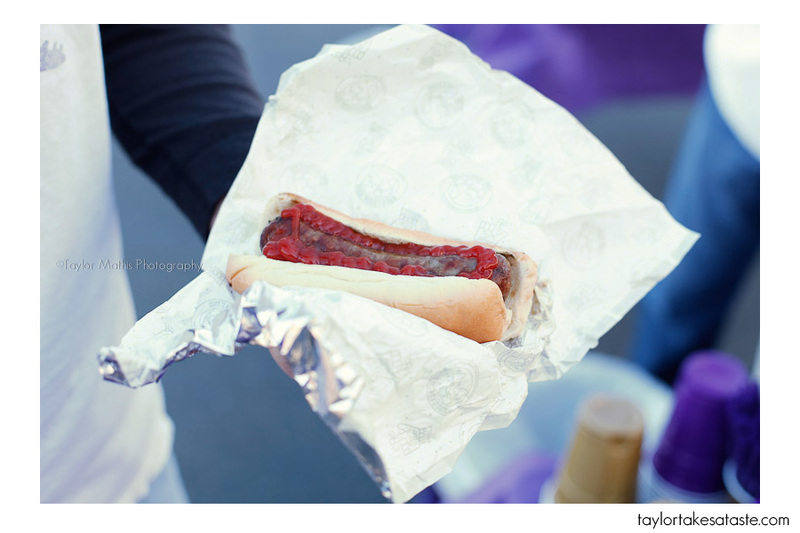 How do you wash down a meal like this and get your tailgate started on the right note? With a Mimosa of course! Notice the name on the cup. 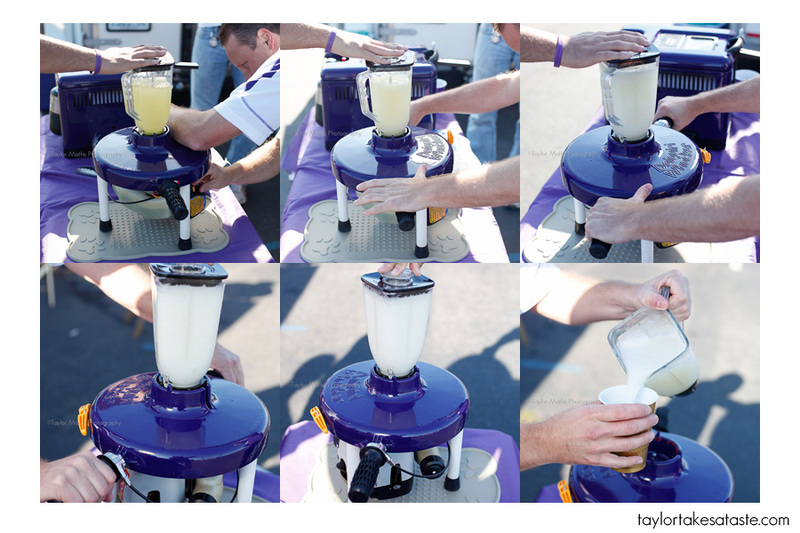 If there was one constant that I noticed through out my tailgating experience at Washington it would have to be the attention to details. 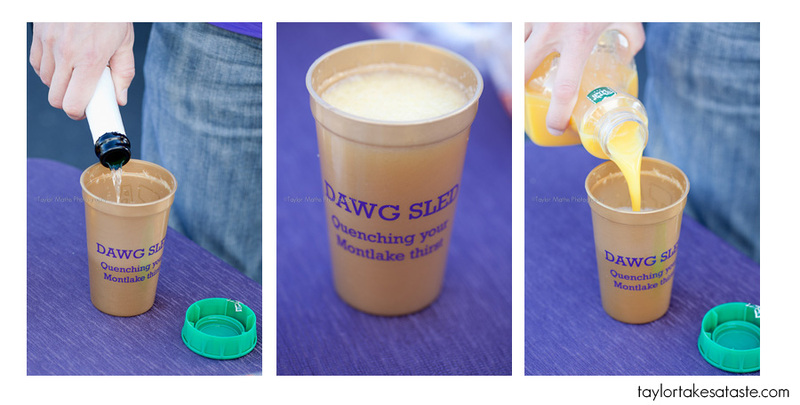 It is little things like having plastic cups with you tailgates name on them that elevates you to elite tailgating status. I have seen great details through out the season, but I learned a few new things here in Washington. For instance, have you ever seen a beer dispensing gold and purple ambulance? Well now you have. This vehicle was purchased on Ebay 2 years ago and transported from Indiana. It has working lights and sirens that could be heard throughout the day. I love the top of the beer tap. A smiling football player, very creative. 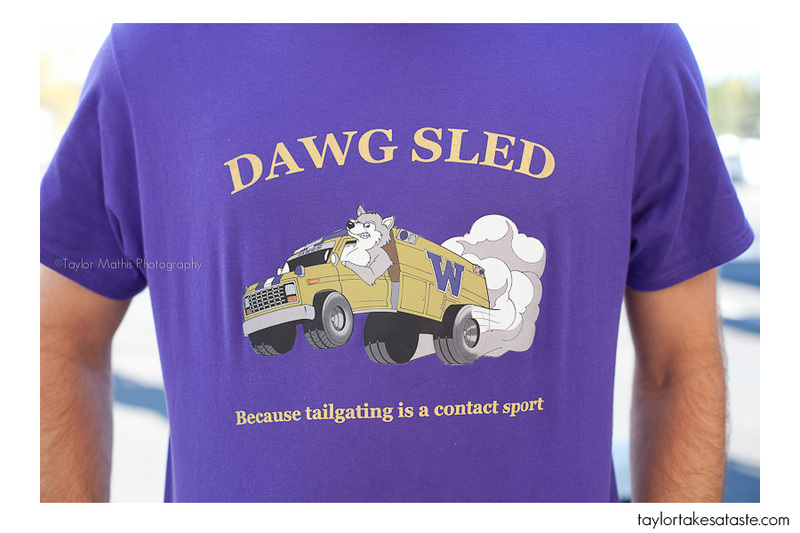 This might only be this Dawg Sled’s second year in action, but they already have some pretty awesome shirts! From one Dawg Sled, I moved to another. This one is not a gold and purple ambulance, but has some pretty impressive features all its own. A trailer complete with Direct TV, Flat screen TV and Keg with tap out front! 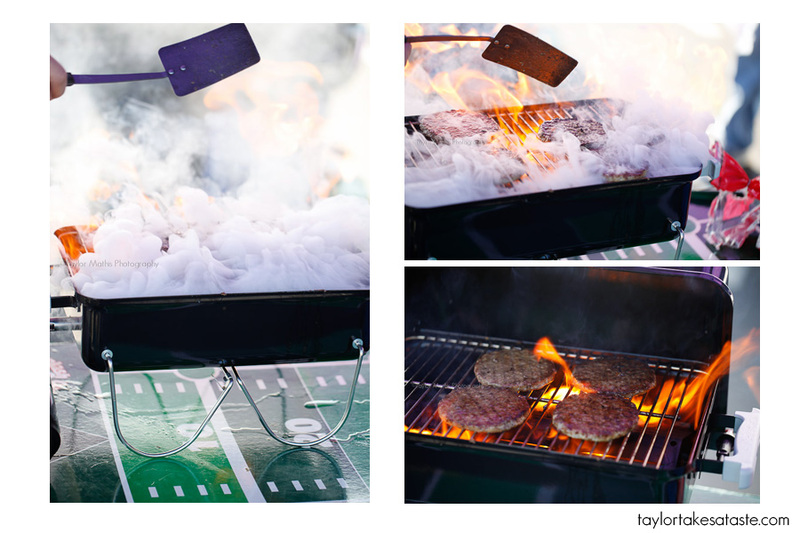 Do you have an ice sculpture at each tailgate? Well The Dawg Sled does. Scott (guy in the purple) learned to carve this sculpture out of a solid block of ice using a chainsaw and hand chisel. He got sick of using a mold that would fail him, so he learned to do it the real way. 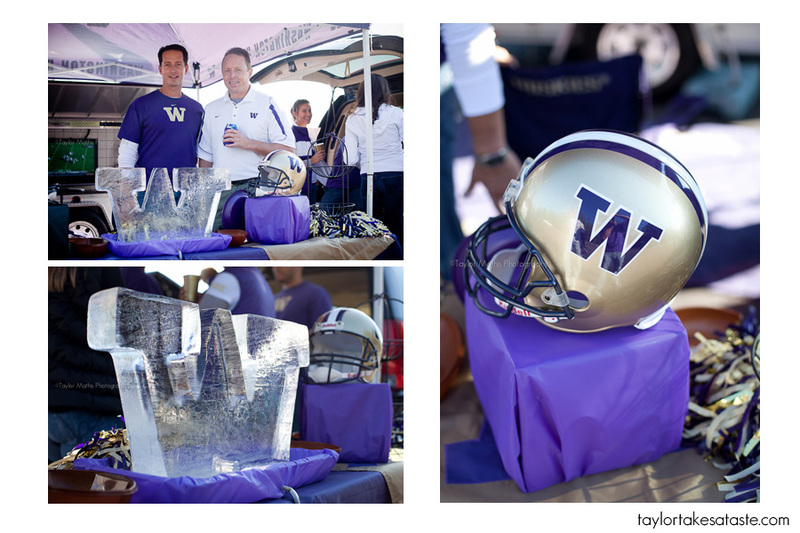 Learning to carve ice so that your tailgate can have an awesome center piece, that is impressive! 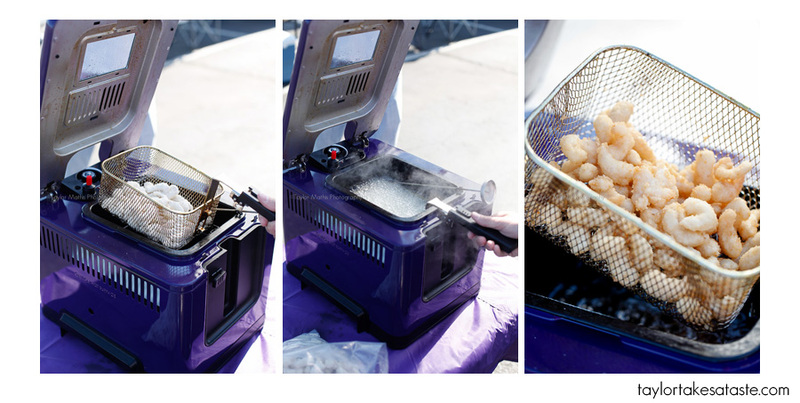 Gas powered deep fryer and gas powered margarita maker! They don’t come in purple, but after a little trip to an auto body shop problem solved. You now have 2 matching machines! So what does one do with a deep fryer? Fry up some shrimp of course! And the gas powered blender? add some ice and and hold on! 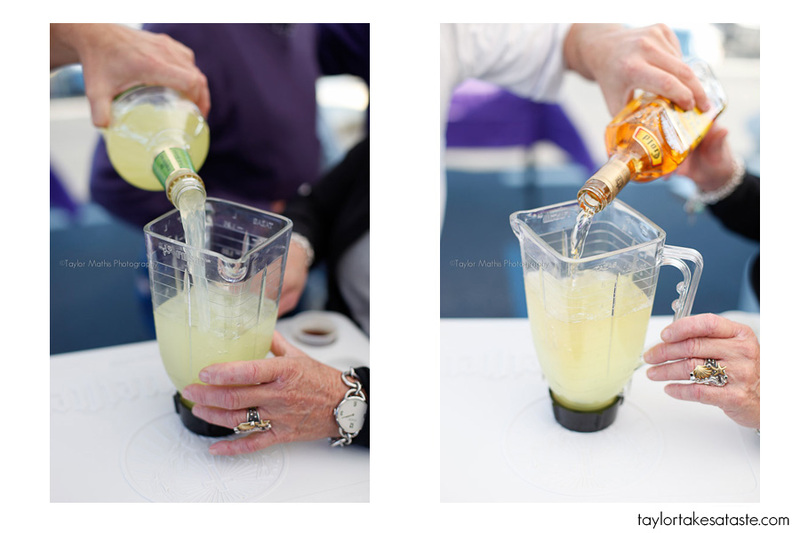 The blender has a throttle similar to a motor cycle and blends up one tasty margarita. Grape and Lemon jello shots! 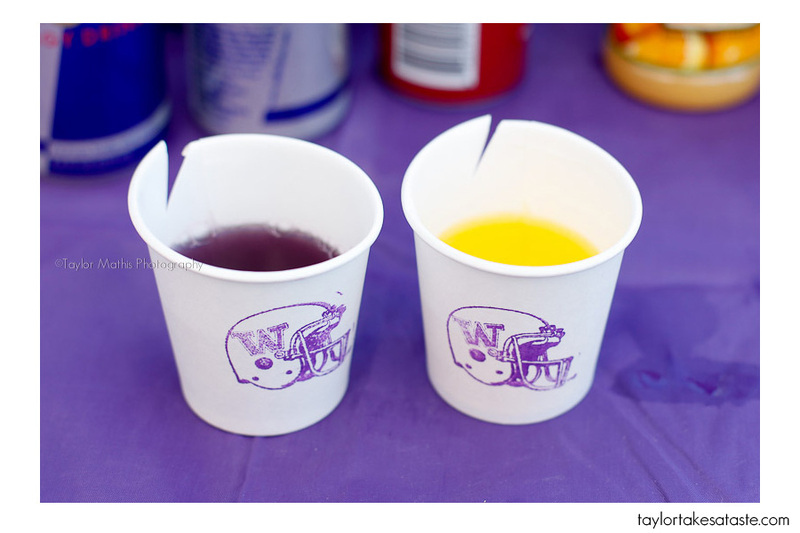 I love how the cups each have a Washington Football stamp on them. You might be wondering why the back of each cup is cut? The cut allows you to easily peel the cup away from the jello inside. This makes it incredible easy to eat all of the jello inside! I had never seen this before, but this was not the only first for jello shots I saw while in Washington. These may look like normal lemons, but look closer and you will discover that the inside of the lemon has been replaced with an alcoholic jello mix! 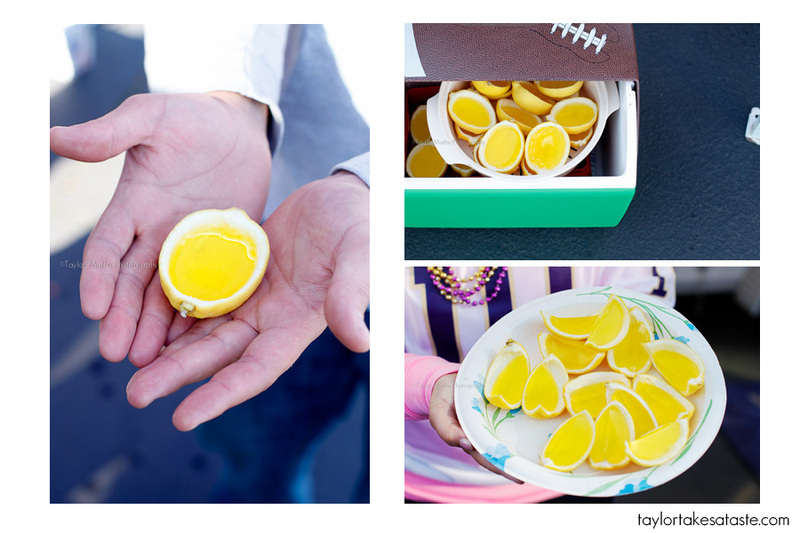 I am sure it takes a while to create these jello shots, but the attention to detail and creativity is quite impressive! 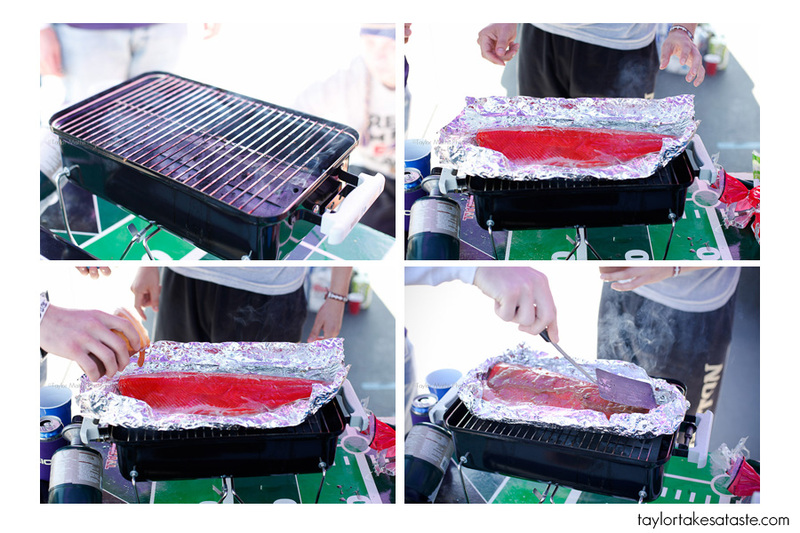 The details didn’t stop at jello shots, they were present throughout the other tailgates I visited. 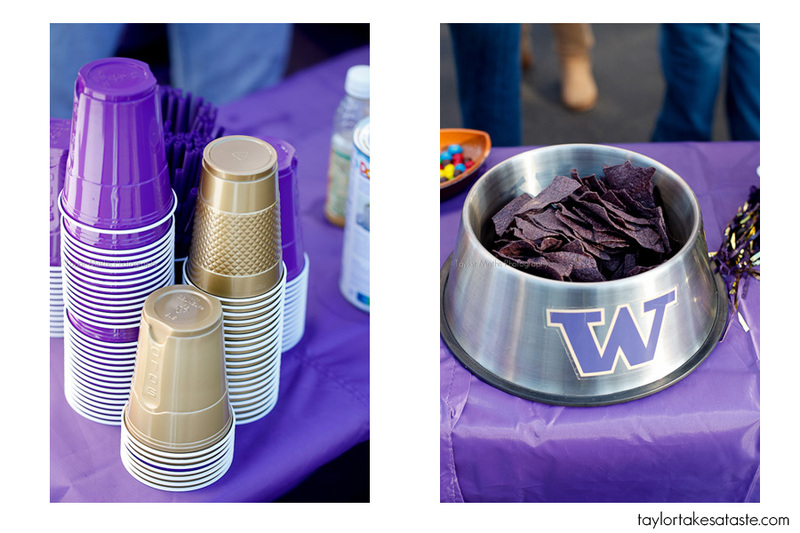 With Washington being the Huskies, I thought it was clever to serve chips out of dog bowls! Notice how the chips are purple as well! Being a Wisconsin alum, it was always easy to find red plastic cups. Red and blue are the two colors that are generally made. 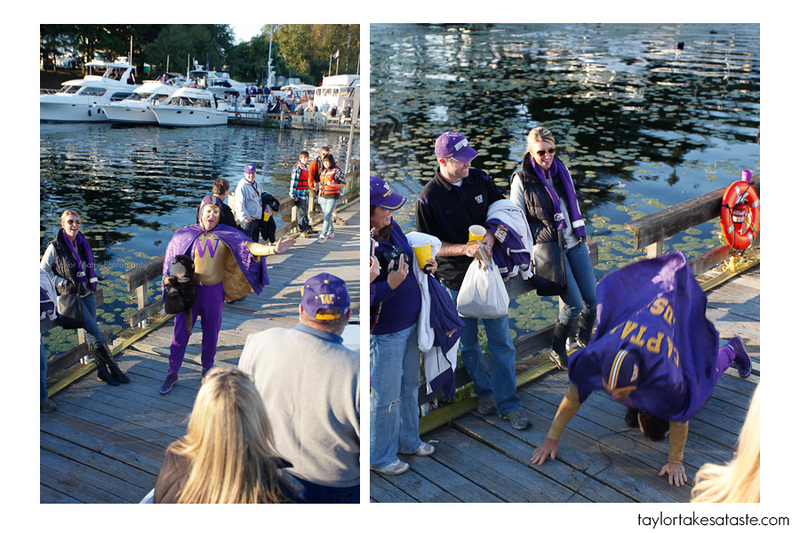 Washington fans putting in the extra effort to find purple and gold is impressive. 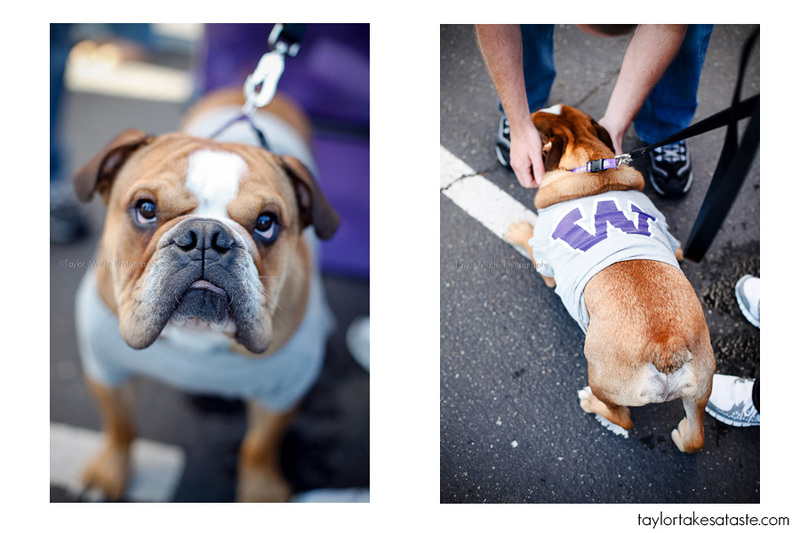 Since I have shown you a dog bowl, I have to include the two canine friends I met while tailgating. Say hello to Pluto the bulldog! He loves wearing his W shirt and eating ice that has fallen on the ground. I was incredibly excited to also find.. Sorry for the brief canine interruption, back to the gold and purple cups. Of course they are not just for drinking out of, they are for games as well! 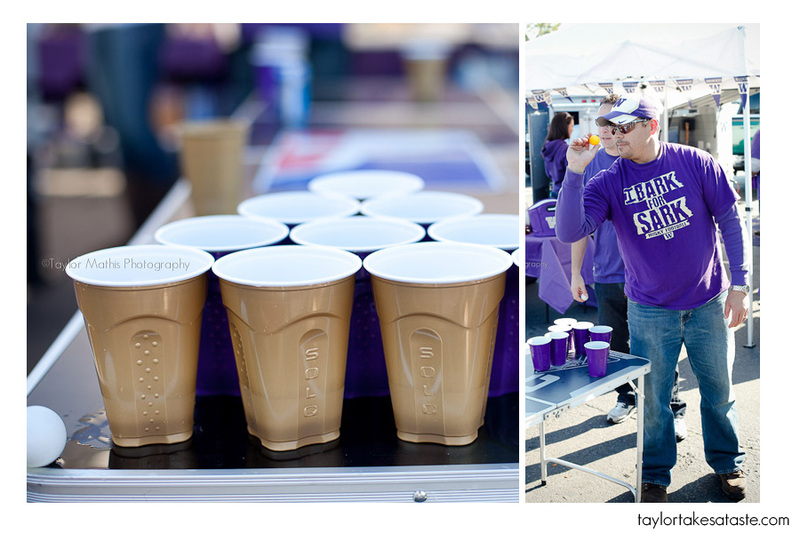 Beer pong is a classic tailgating game and I have seen it at the majority of tailgates I have been to. 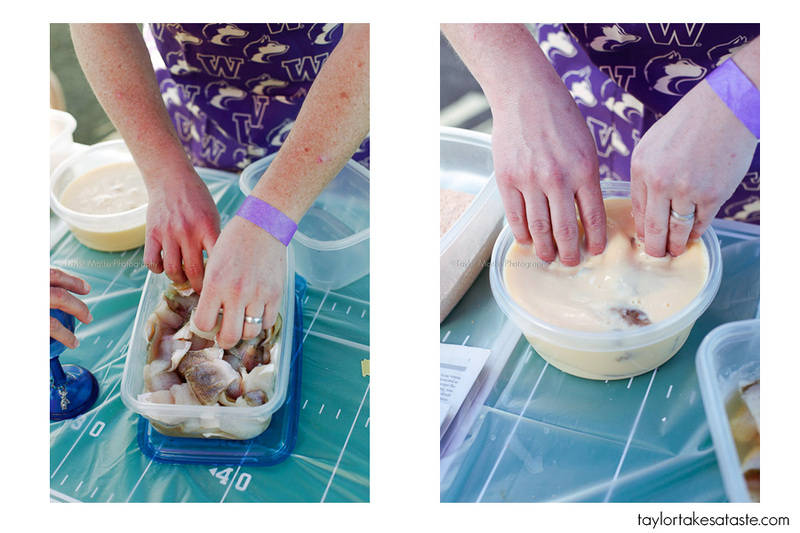 In Washington, I did see a few new tailgating games. 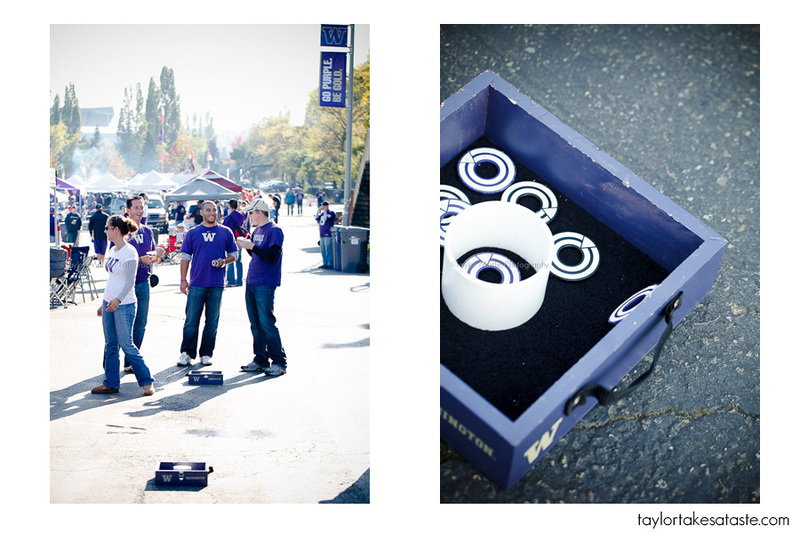 At Penn State, I saw this washers game from afar, but this is the first time I learned about how to play. You receive different point values for landing your washer ring inside the box and a higher value for inside the PVC tube. In a round, each team takes turns and the scores are the net of the round. So if Team A scores 4 points and Team B scores 2 points, Team A wins the round and receives 2 points. You play until a point total of either 11 or 21 is reached. It might look easy, but looks are deceiving. The little weight and circular shape made these discs difficult to land. If rings are not your thing then how about horse shoes? This game involved throwing horse shoes and trying to ring them around the poles on the opposite side. There are different points awarded for the rings ringing one of the poles, hitting the pole or bouncing off one pole and ringing another. I love how the game has built in cup holders. and brats. 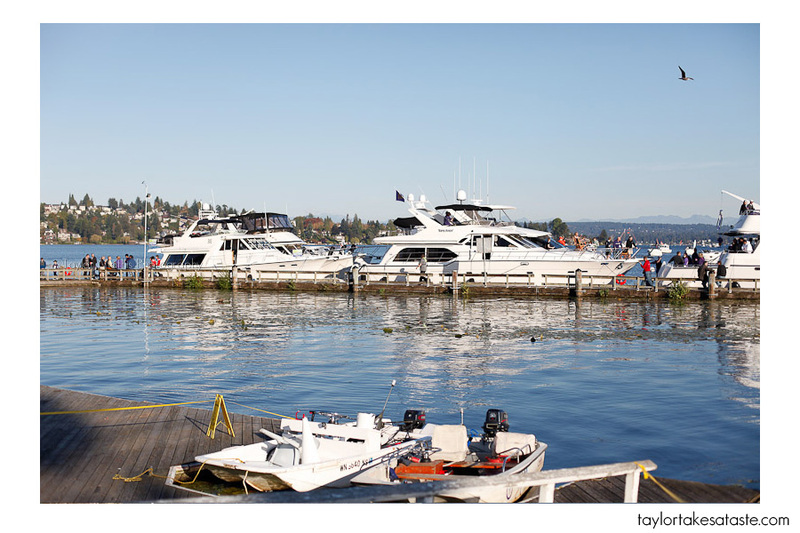 With this being the Pacific Northwest, I was hoping to see tailgaters go the sea food route. Luckily I ran into this group of tailgaters and was not disappointed. I was so excited to see Salmon! 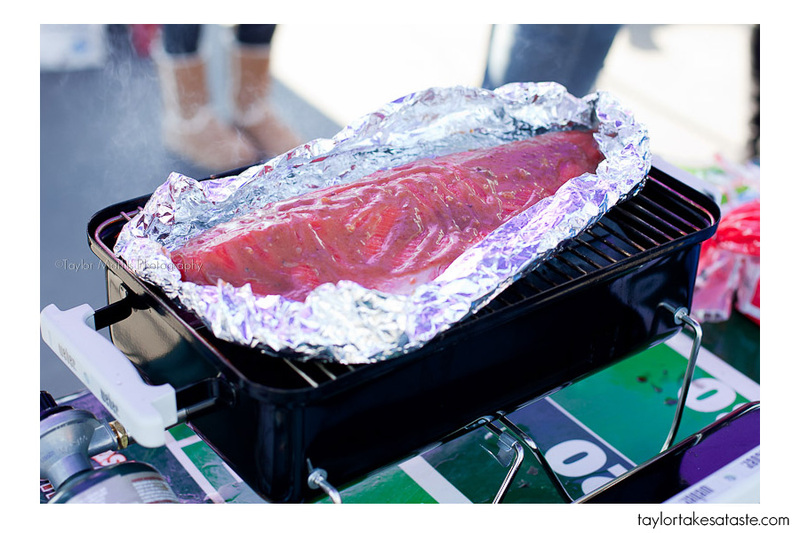 The Pacific Northwest is known for having great salmon, so I had envisioned this being at a tailgate. My dreams became a reality when I saw this fish on the grill. Covered in what was called “Jeff’s Dad’s Special Sauce” this fish was ready to be cooked. 20 or so minutes later here was the results. how about smoked? If you don’t like Salmon in general, don’t worry this was not the only fish that I saw. 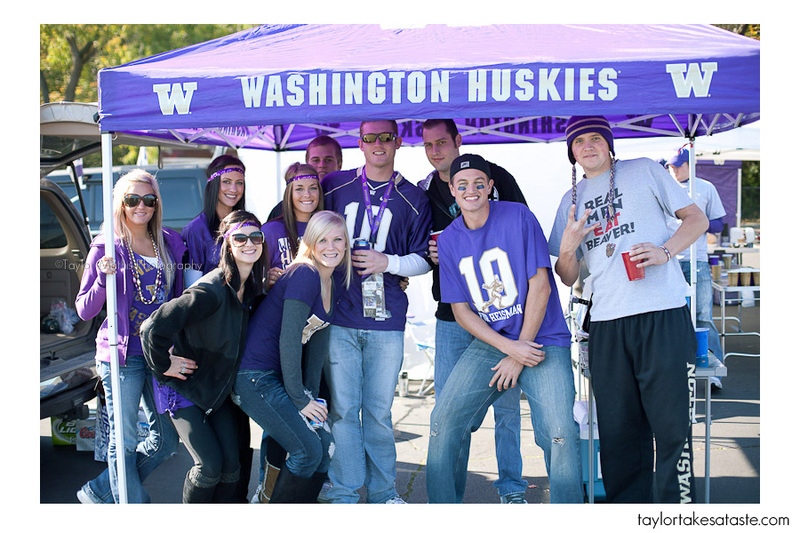 The 6th qWarter is a group of Husky tailgaters who are at the height of tailgating cuisine. 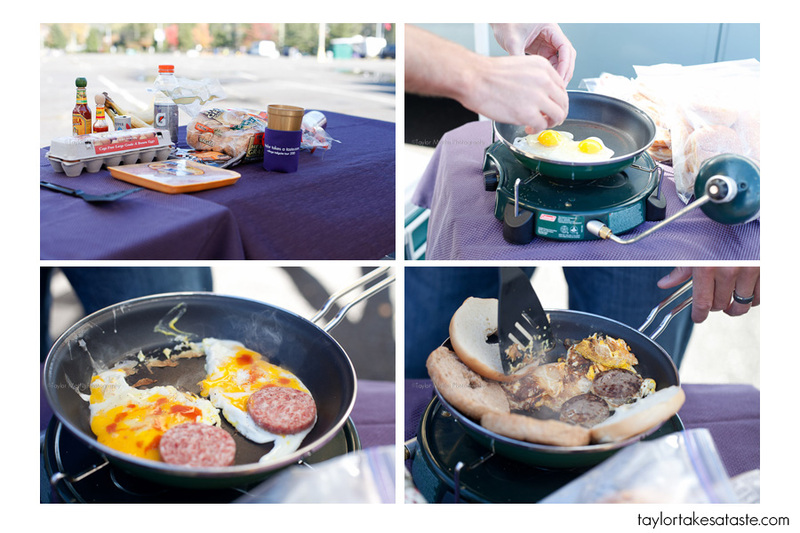 Throughout this tour I have seen that tailgating is so much more than just burgers and hot dogs. 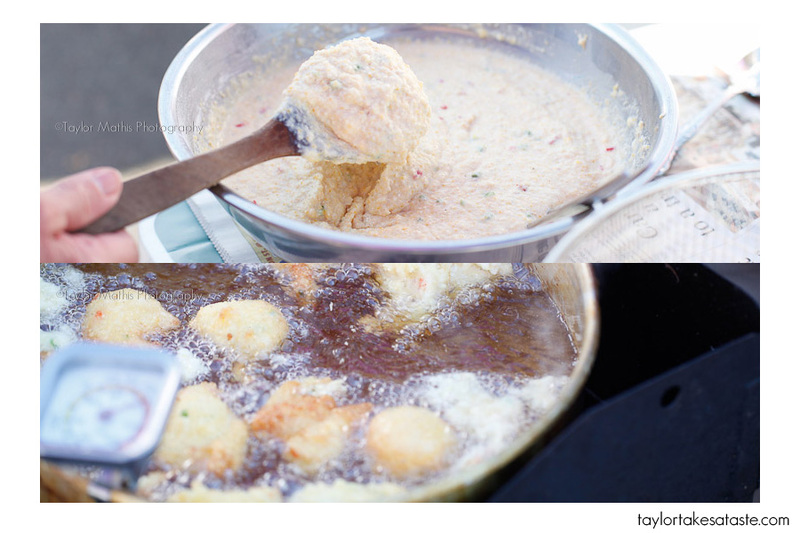 These tailgaters dine on the highest of levels. 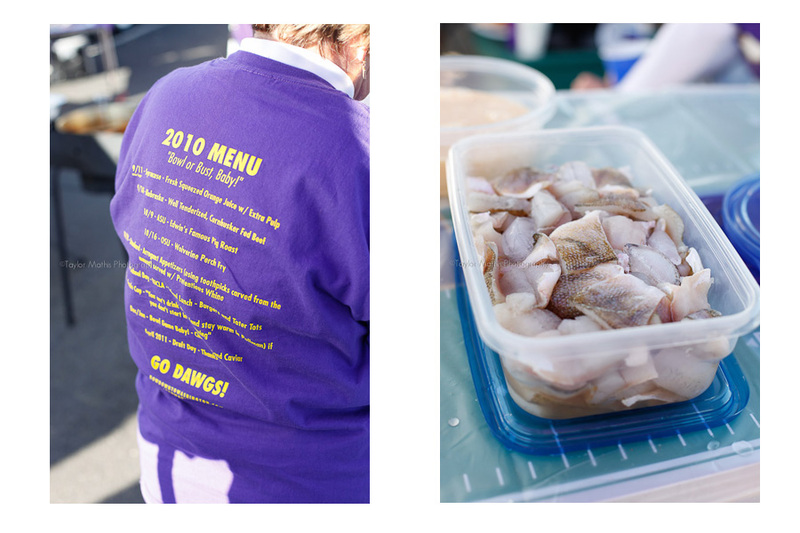 They are the first tailgate I have seen that has a menu on the back of their shirts. Each week has a menu themed to the opponent. For example, the Syracuse game had “Fresh squeezed Orange Juice with extra pulp” For those of you who don’t get the joke, Syracuse’s mascot is the Orangemen. My favorite was for the Stanford game. “Arrogant Appetizers (using toothpicks carved from the mascot) served with Pretentious whine. Stanford has a tree as its mascot. 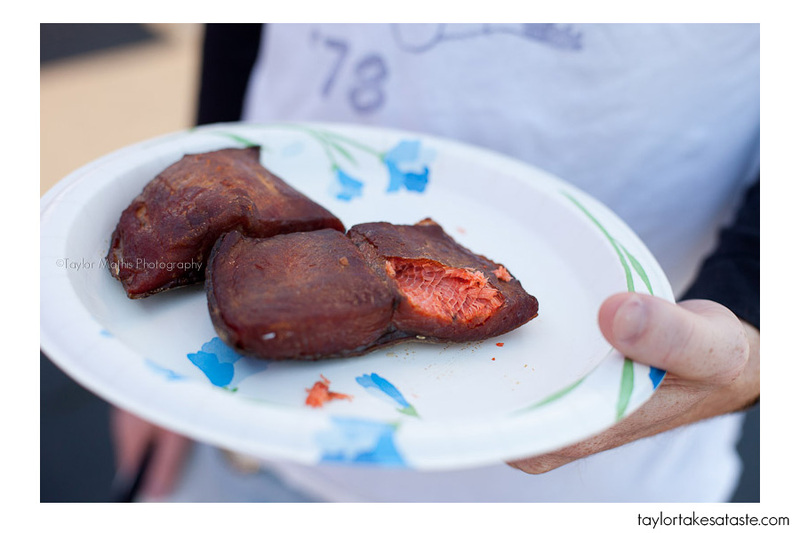 The Oregon St. beavers were the opponent on this game day, don’t worry they were not serving fried beaver. Instead they served Perch that had been flown in from Michigan. 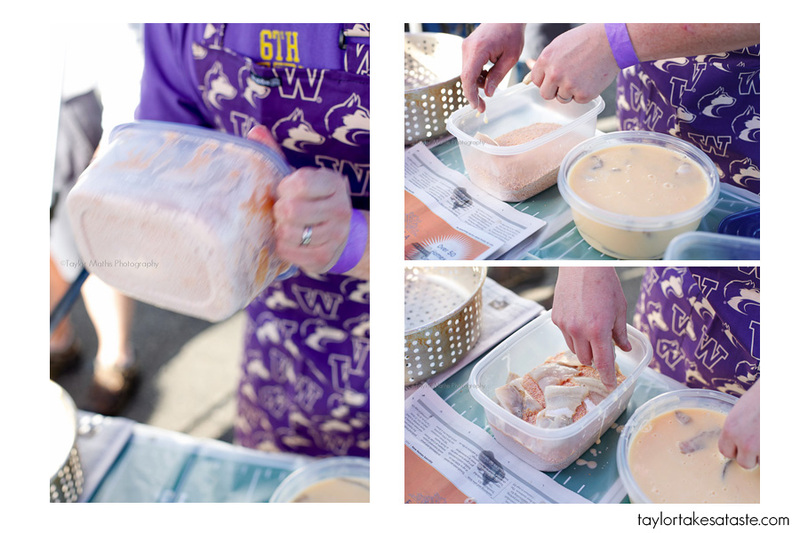 This tailgating group has a partnership with a tailgating group in Michigan and every year they exchange seafood. 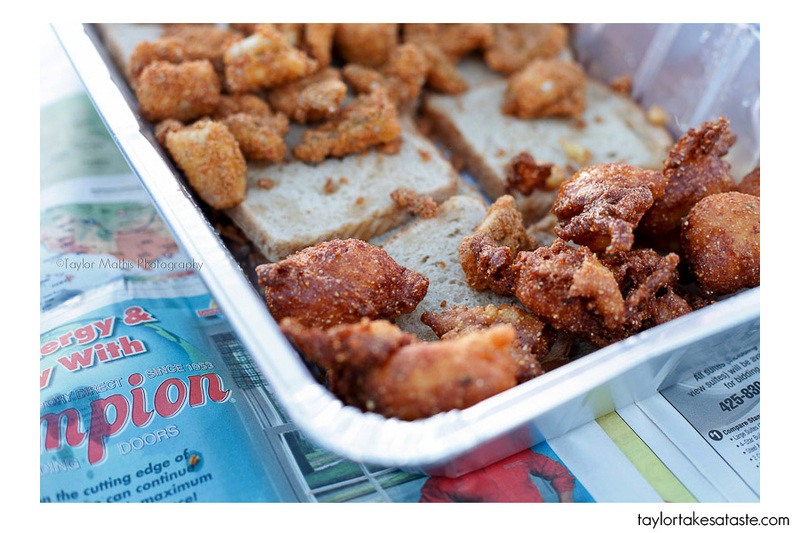 Michigan sends Perch to Seattle and these tailgaters send Salmon and Crab to Michigan. I think that it is awesome tailgating has brought two fan bases together like this. 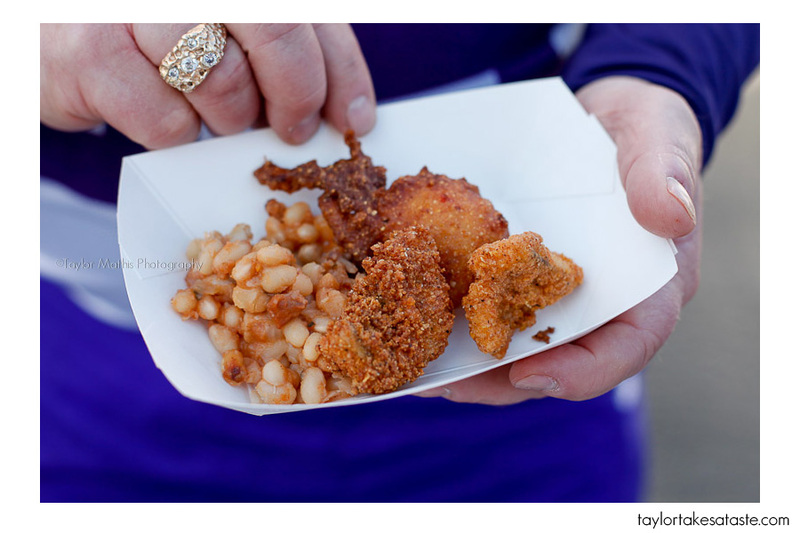 They might disagree on who to cheer for, but it is such a cool concept to see two tailgating groups sharing their love for tailgating through food. You can’t find fresh Perch from the great lakes in Seattle and the same goes for fresh salmon in Ann Arbor, so each group gets to try something different! Just an overall very cool concept. Alright enough talking on to the food. 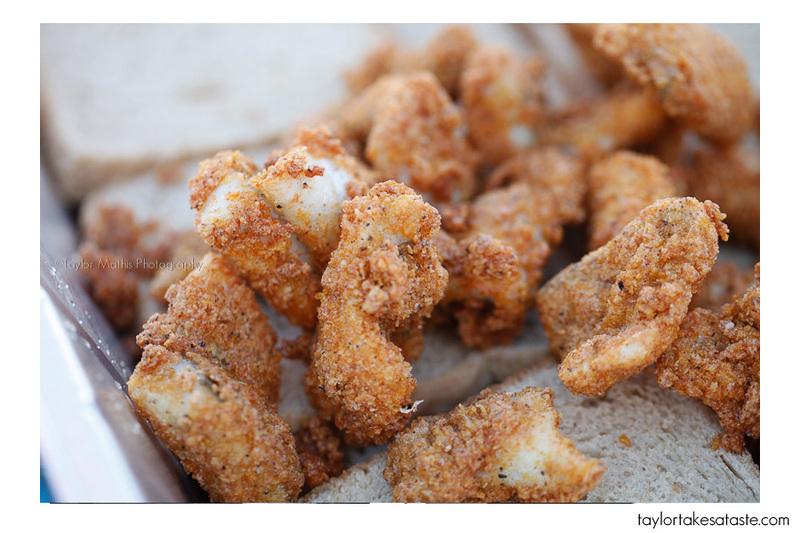 The fish is covered in an egg mixture then coated in a combination of corn flakes, flour and a variety of seasonings. The corn flakes might sound strange, but were awesome! They added a sweetness and crunch to the final dish. They are now ready for a hot oil bath. 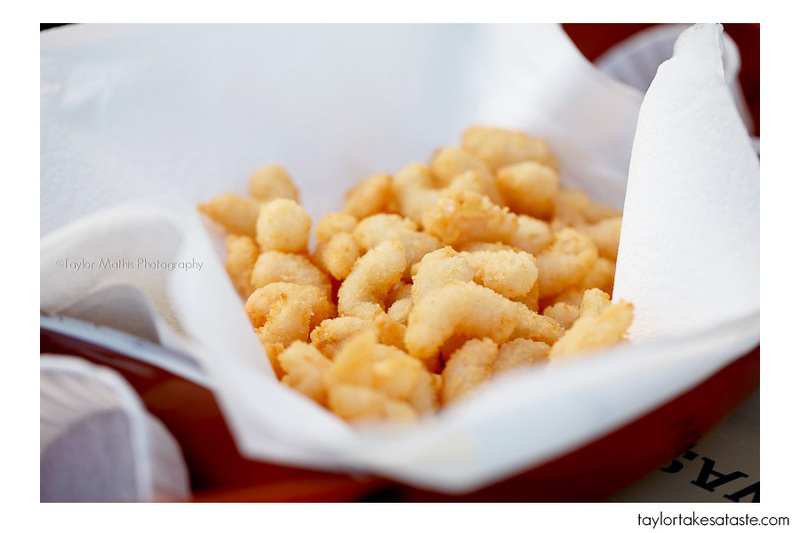 Delicious fried fish. 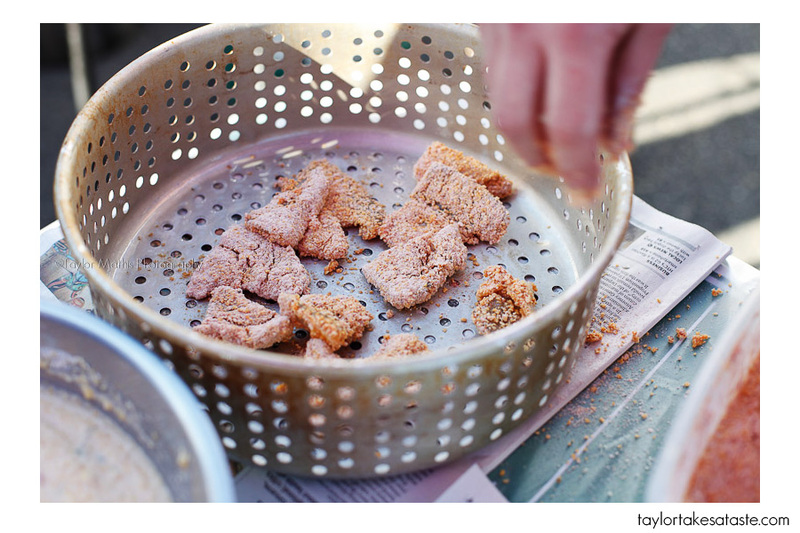 When you have several gallons of hot oil, why stop at just fish? How about some jalepeno hushpuppies! Crunchy and golden brown. Delicious! With the addition of baked beans you now have a tailgating plate that I am sure the Michigan fans would appreciate as well. 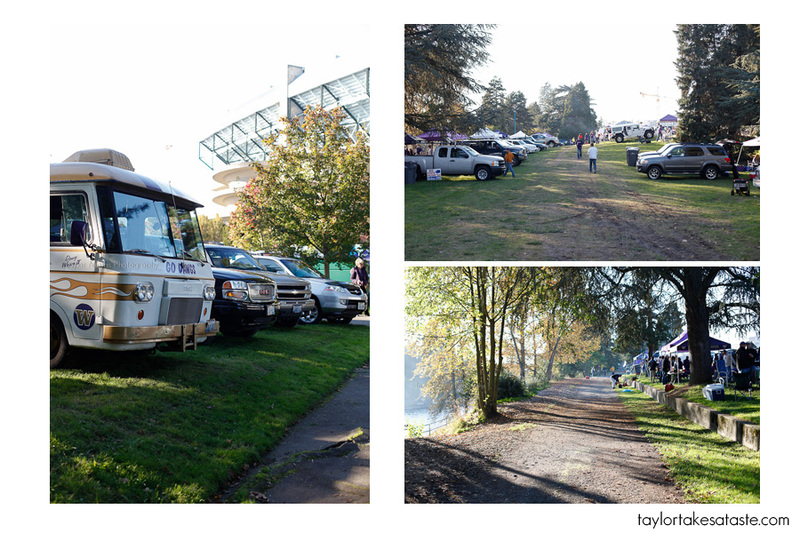 After several hours in the main parking lot it was time to leave and investigate the rest of the Washington tailgating scene. 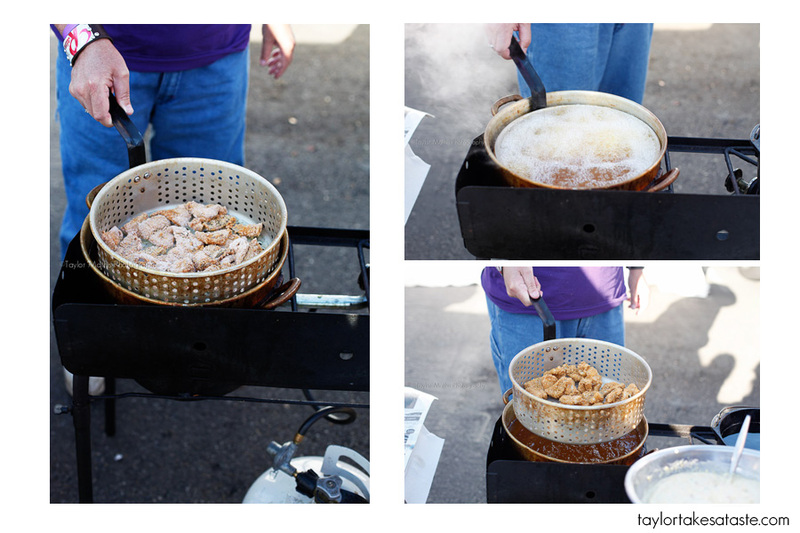 There was another lot to check out and more importantly a new kind of tailgating. First with the second lot. The second lot was similar to the first, cars and tents everywhere. The main difference was the beautiful view of the water. I also got to see the construction I had heard all about. 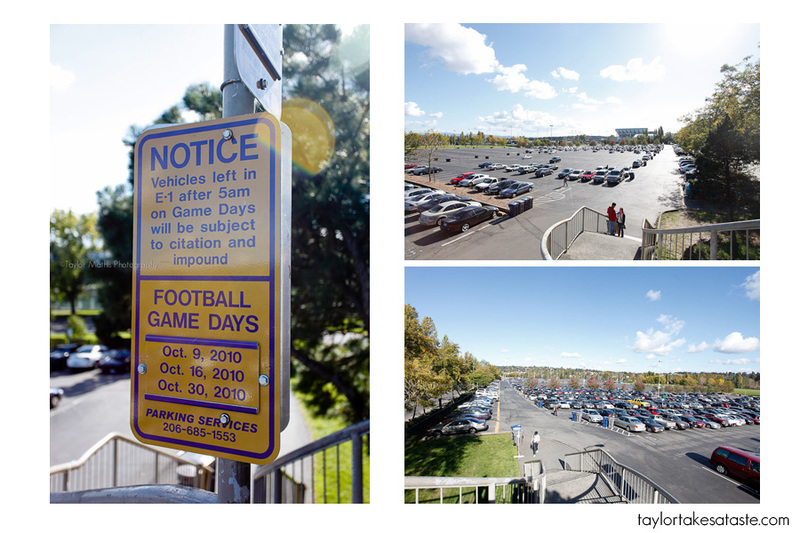 The construction of a lite rail station in the South lot caused the parking changes that a lot of tailgaters were unhappy about. Despite these changes, I still found a few amusing things in this other lot. 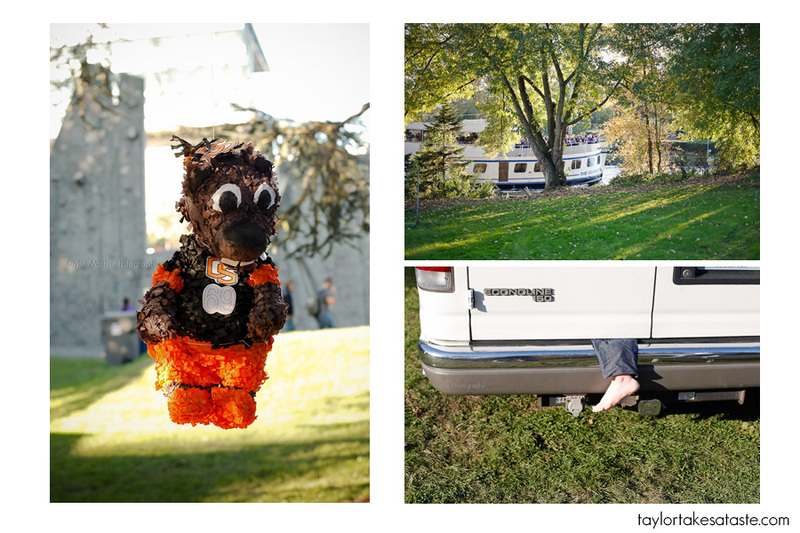 I found the OSU pinata amusing as well as the fake foot in the van. In the South lot you can see plenty of charter boats with fans on them. Yes that is right, boats. 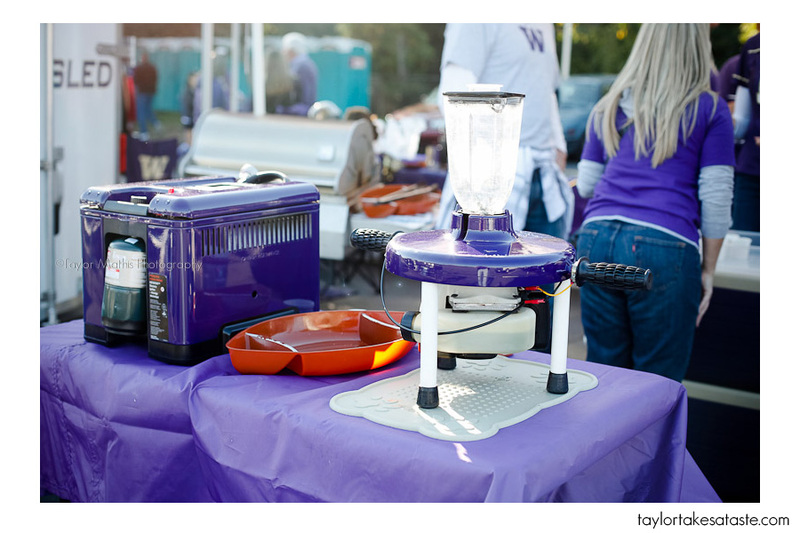 Tailgating in Washington is done on both land and water. 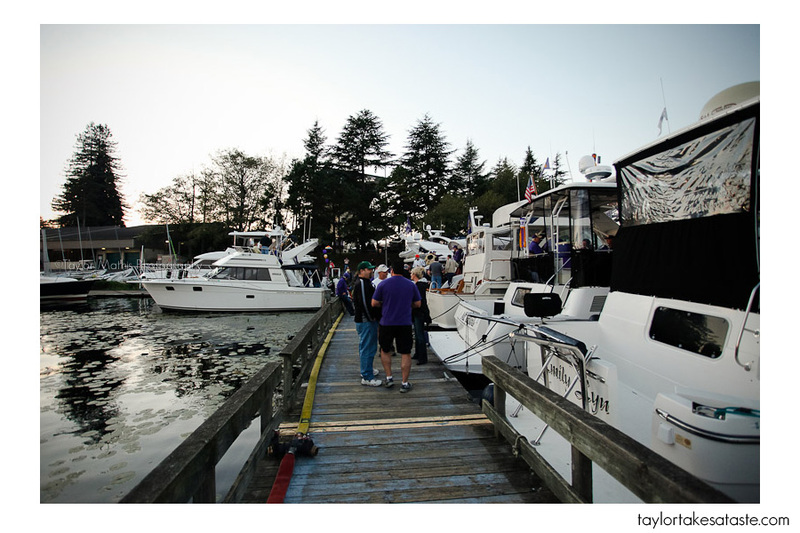 In between the two lots you can find both OSU and Washington fans enjoying “sailgating” or tailgating on a boat. Here is what the boat gating area looked like the day before. On Saturday, there was a quite different atmosphere. 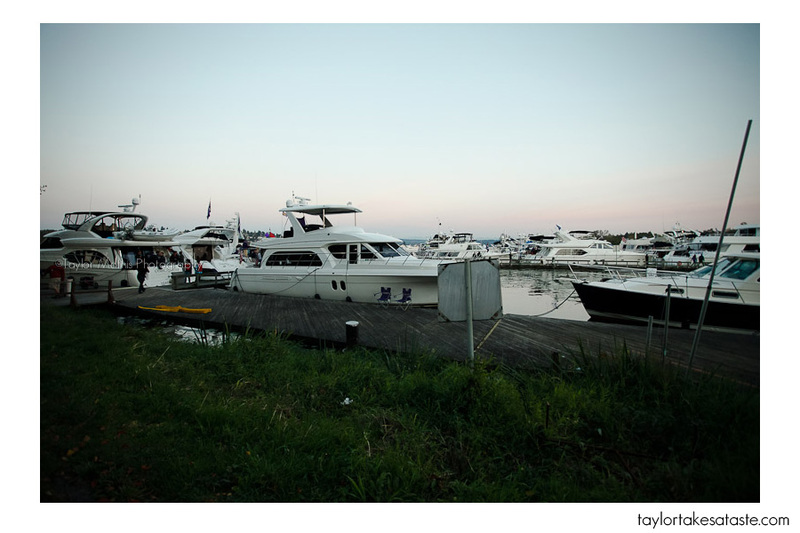 I am not sure how many boats there were docked for this tailgate, but tailgating on the water is an awesome experience! 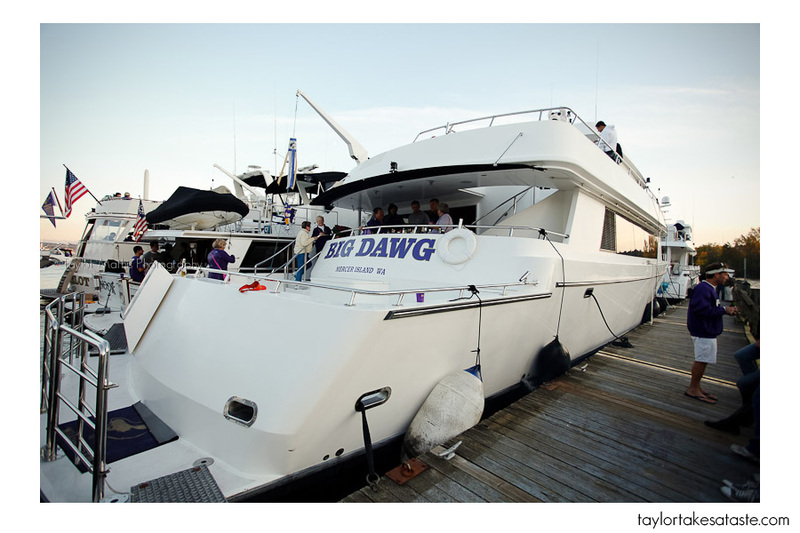 I was able to experience sailgating first hand on the Big Dawg! Why is it called the Big Dawg? Well at 94 feet in length this boat is definitely worthy of such a name. 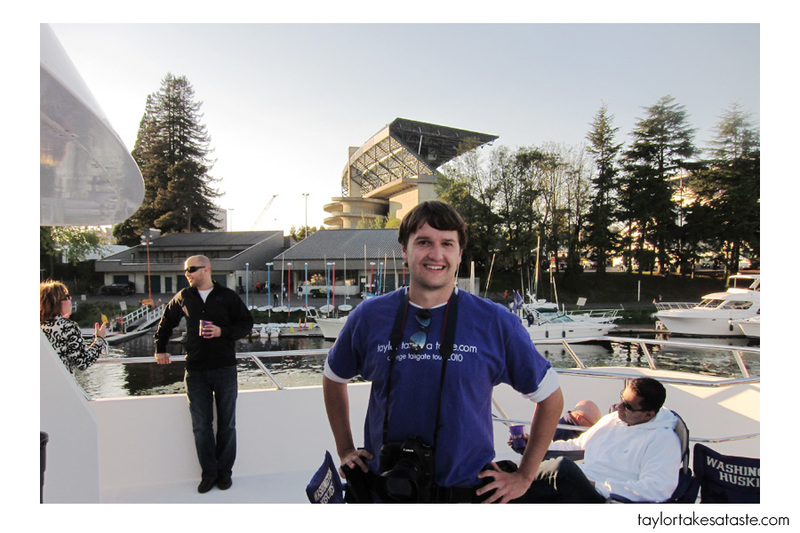 Tailgating on this boat was an awesome experience. Look at the views! 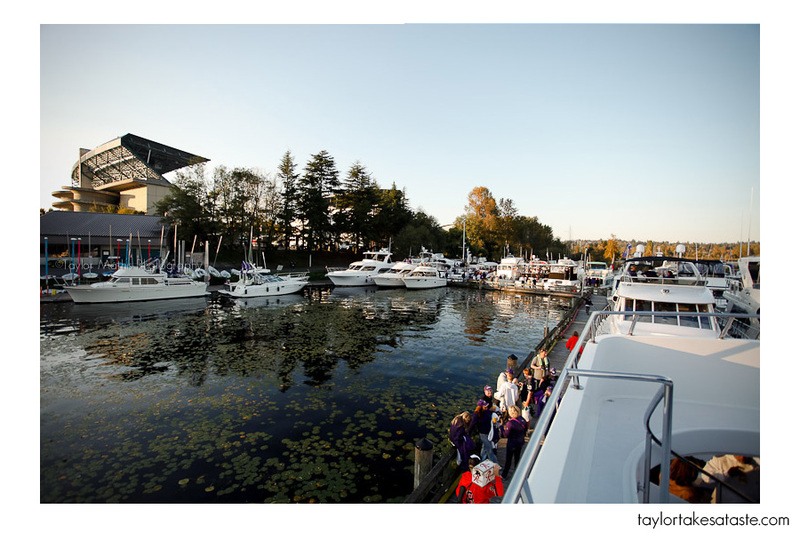 Arriving by boat and docking just a few feet form the stadium is an awesome experience. This is the only college stadium on the west coast where you can sailgate before a college home game. This weekend I will be in Tennessee to visit the only other school that can sailgate. It will be interesting to compare the two. Of course I had to get a picture of myself on the Big Dawg. 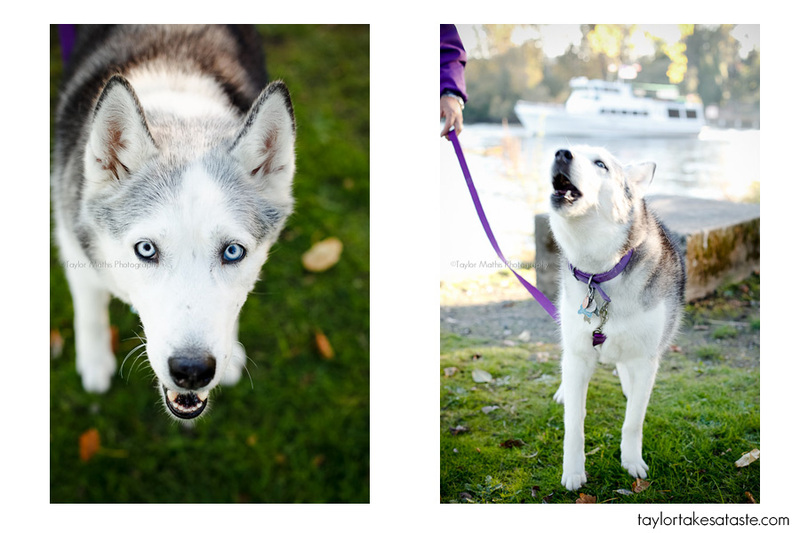 While on the boat, there was a surprise visit from Captain Husky. Captain Husky is an iconic fan of Washington football. During the game, he leads the crowd in cheers and is incredibly entertaining. I was not expecting for him to body slam the stuffed beaver, but I guess it was an omen for the game to come. Washington defeated OSU in a double OT thriller. Thanks to Captain Husky for your appearance! I heard Captain Husky was famous and when I got home I did some searching on google and was able to find dozens of you tube videos featuring him and saw that he is one of ESPN’s top 20 College Football super fans! Thanks again Captain Husky for making an appearance. As the sun was going down it was approaching kick off and my tailgating was coming to an end. 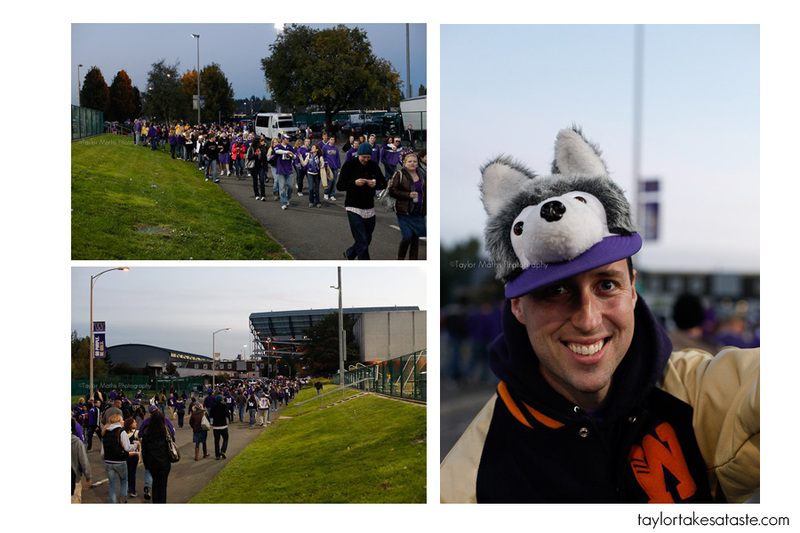 As I headed back towards the main parking lot, I past thousands of excited Husky fans! It was hard to believe that this is the parking lot I showed up to 8 hours earlier. Upon leaving, I saw a much different scene. 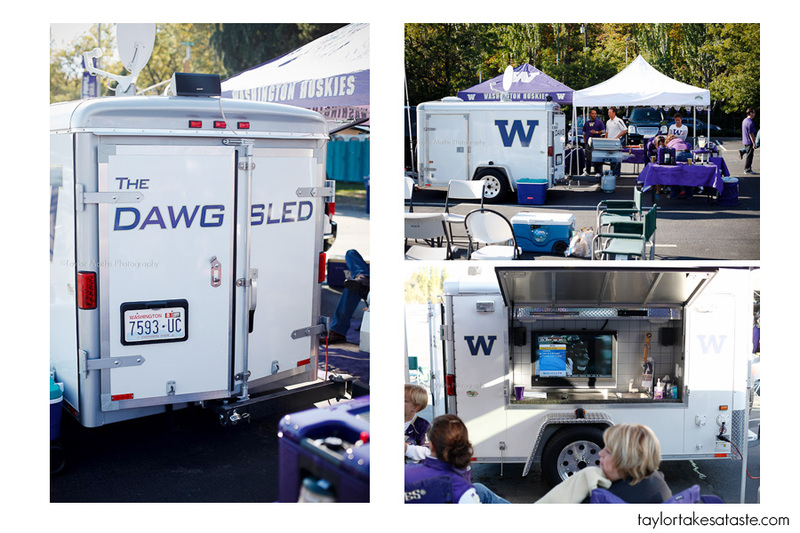 Thank you again to the Clarks, Captain Husky, the tailgaters on The Big Dawg, Dawg Sled, the tailgaters of the 6th qwarter, and everyone else I met during my time tailgating in Washington! The next stop is Tennessee! 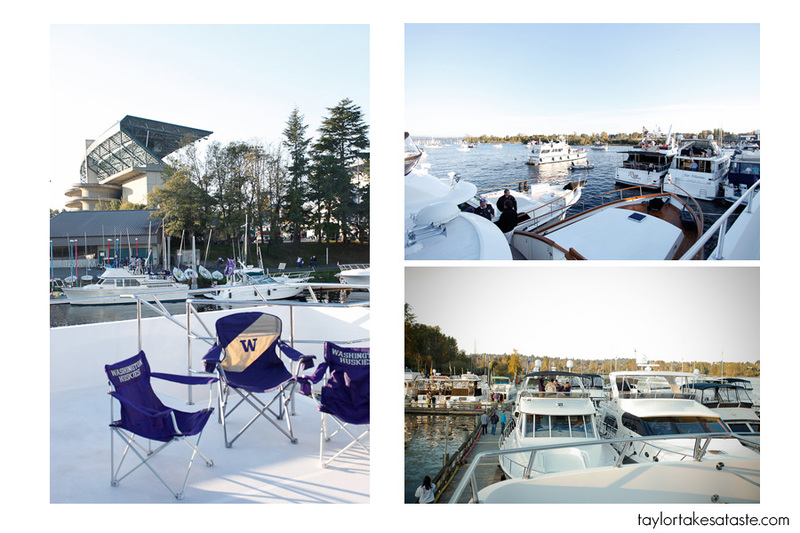 I am headed there this weekend to check out the only other college stadium in the country where you can arrive and tailgate by both land and water! WHOA. This is one of the best ones yet! 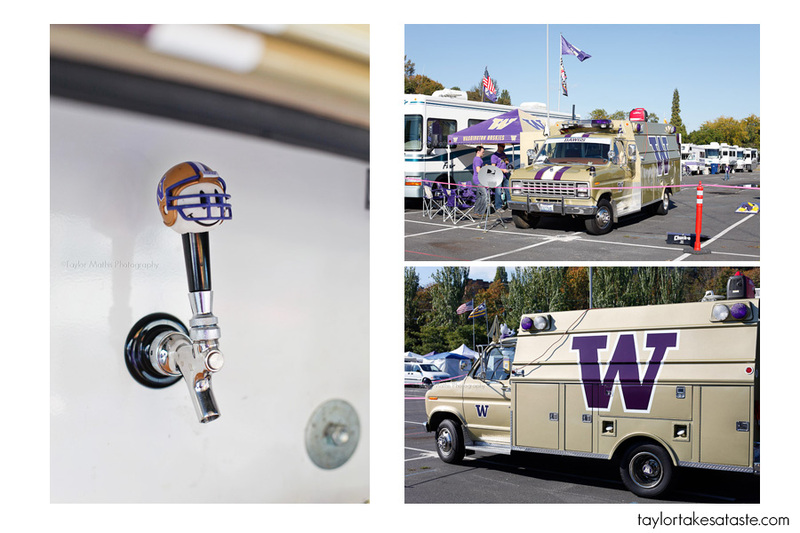 Washington DEFINITELY knows how to tailgate! I remember that from years ago. Hahahah. What a fabulous experience, and your photos are truly phenomenal. You even got to go on a tailgating boat! How fun it THAT?! When are you going to need two assistants? We are excellent taste testers of both booze and food. Awesome pictures!! It was great hanging out with you at our tailgate, best of luck on the remainder of your tailgating experience! Great article. 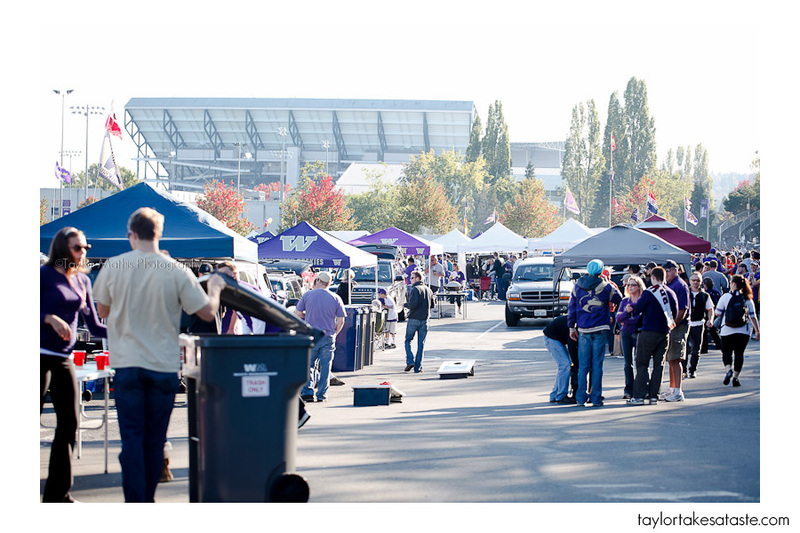 As a U-dub fan and tailgaiter (north lot style), I was unaware of some of the other great scenes occurring all around the stadium. Come back any time Taylor. You seem to be our good luck charm. Woof! Woof! 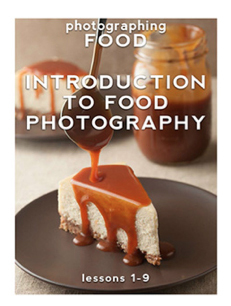 Wow, this looks amazing…all that food is making me drool lol. Definitely looks like a world of fun! 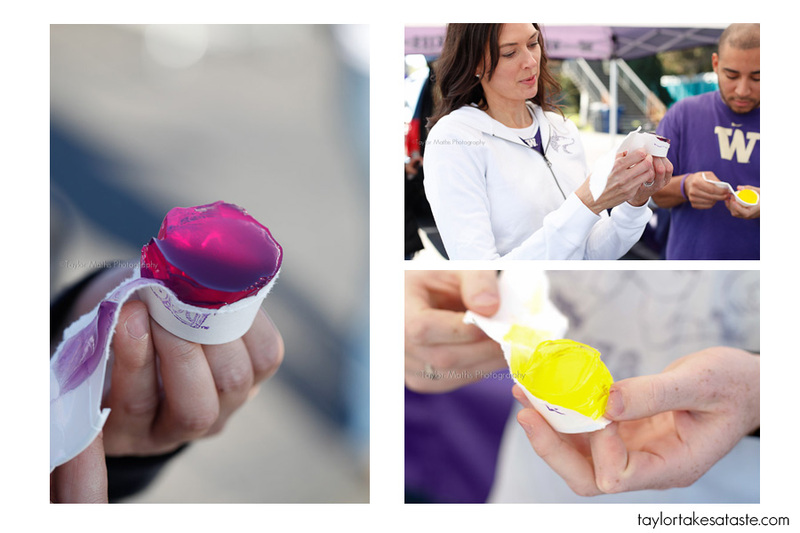 I make the same jell-o shots for Colts tailgates! They are so much fun to consume that they are gone within minutes! 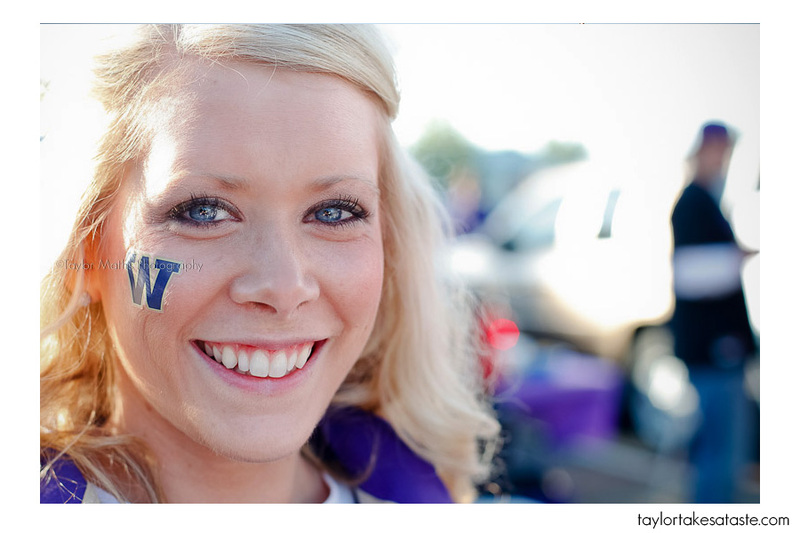 As a UW alumna, this definitely brings back great memories! Your pictures are great and make me proud to be a Husky! Glad you had a good time!! 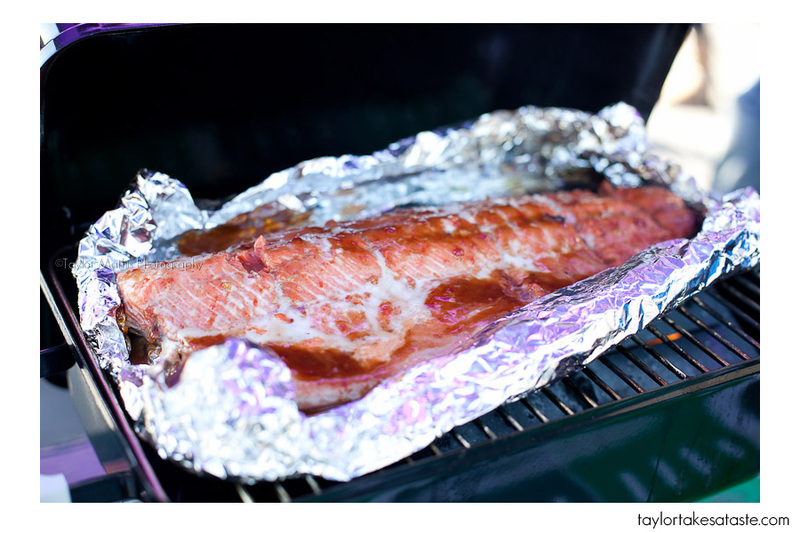 Outstanding spread–I thought our tailgates were great but some of these guys go whole hog! 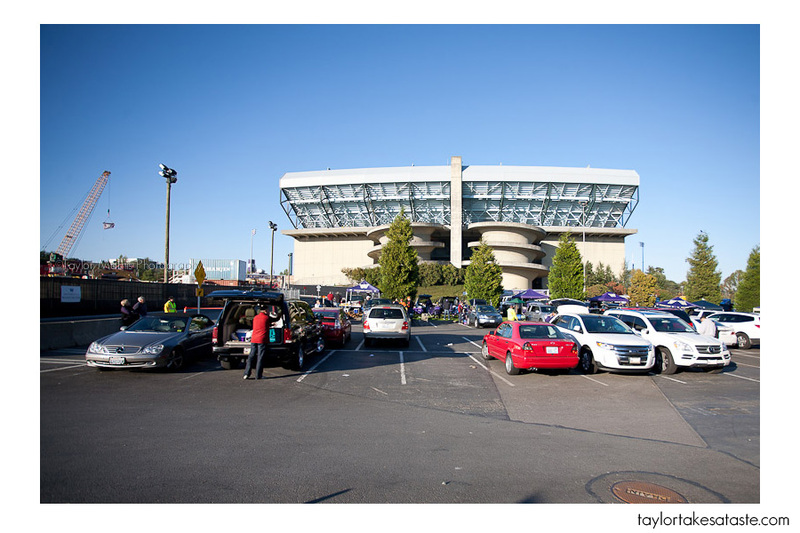 Sorry you missed the other great site on campus–on the hill just above the main lot is a large terraced garage with without a doubt the best views in college football tailgating. 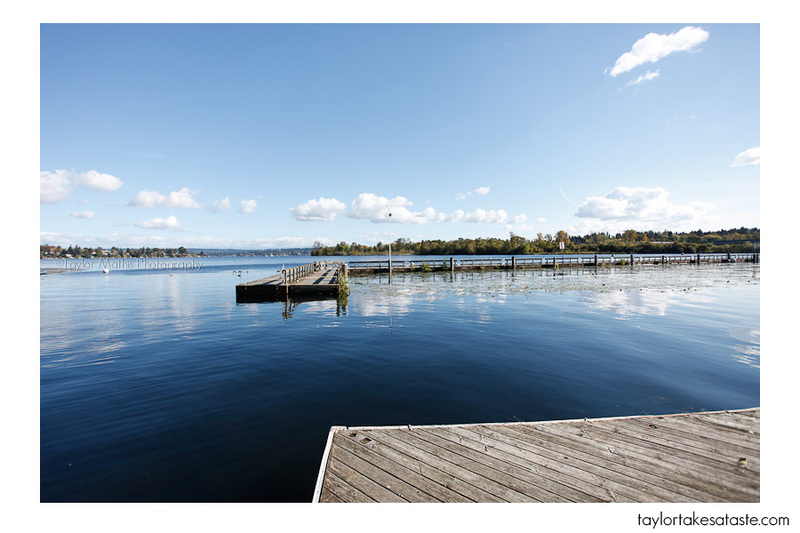 The garage is open to the air on each level and has views out over the main lot, the lake and the Cascades beyond. 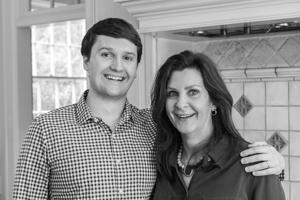 Hope you make it back out soon and c’mon up to visit us up there! 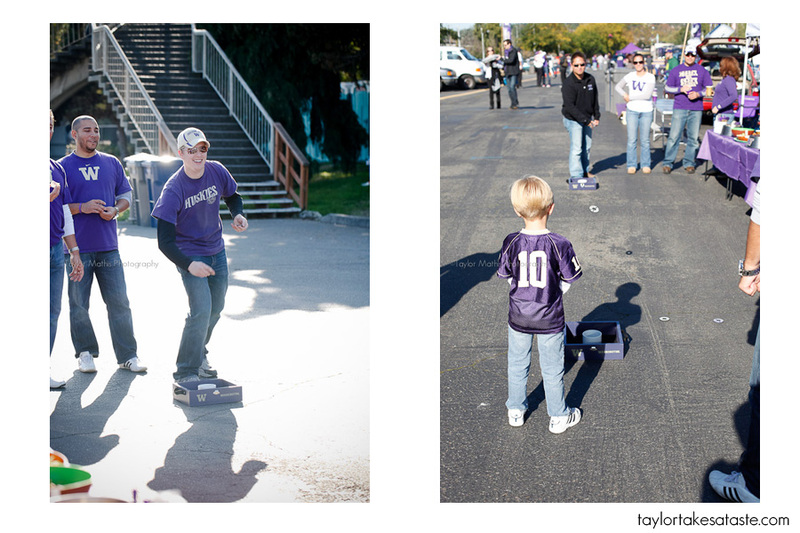 The horse shoes game has become pretty common at UW now, but our buddy started it, calling it “Beer shoes”. Great game ! This is fantastic! 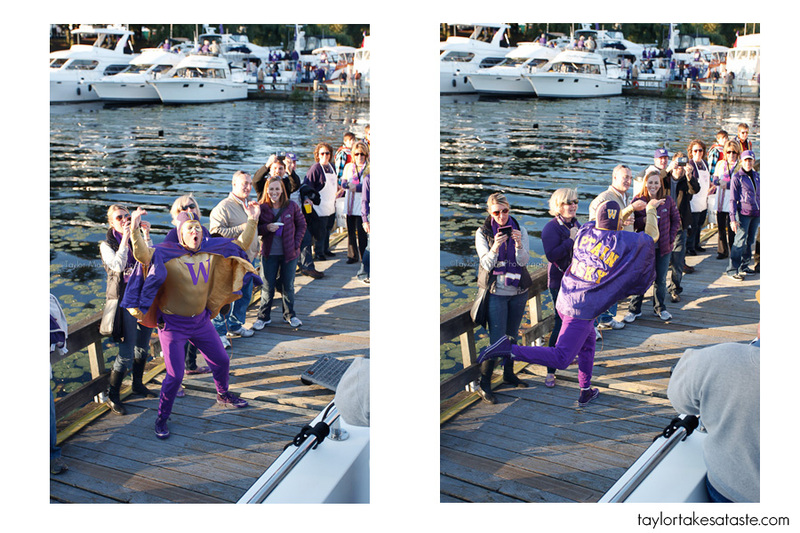 As a UW Alum living in Atlanta, I really enjoyed this…one thing missing: The UW Marching Band. I thought they usually played after the game for the tailgaters, but could be if it was a night game it didn’t work out. Thanks everyone! I had a great time at UW. 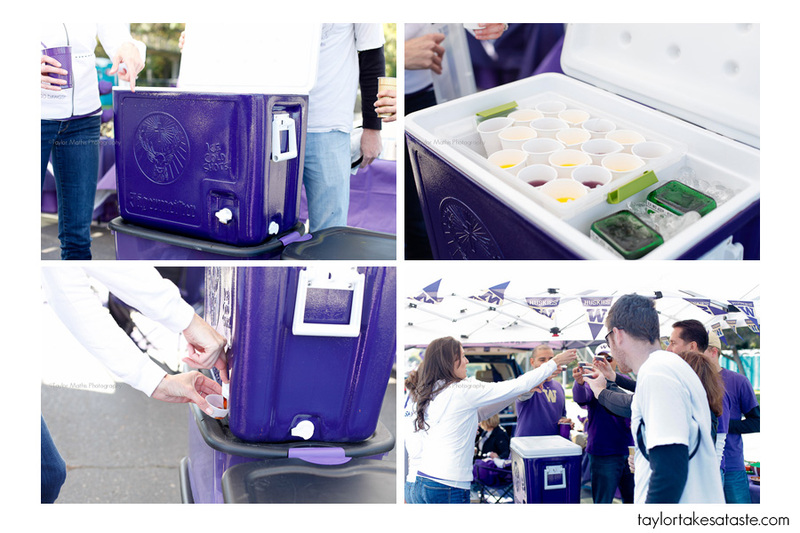 I did not really know what to expect going into the tailgate, but tailgating on water might be the best way to tailgate. Scott, I will definitely check out the other side of the hill next time I am tailgating at UW. Thanks again everyone!